Portsmouth is a city on the South coast of England in the UK. As of 2005, the city itself had an estimated population of 189,000, and lies within a larger urban area with a population of 442,252. Historically, and in fact right to the present day, Portsmouth has been a important base for the Royal Navy, as well as a important commercial base. 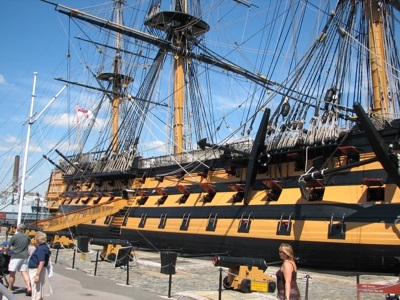 The city contains the world's oldest dry dock still in use, as well as HMS Victory (Lord Nelson's ship at the Battle of Trafalgar, 1805), the oldest naval ship still in commission. HMS Victory although technically still in commission is permanently located in a dry dock and is a museum ship open to the public. Portsmouth is a city on the South coast of England. The city is located 64 miles (103 kilometers) Southwest of London and 19 miles (31 kilometers) Southeast of Southampton. Portsmouth is the United Kingdom's only island city, as it is mainly located on Portsea Island. Portsmouth has been an important naval port for centuries. It is still, to this day, home to a Royal Navy dockyard and base, and is also the site of headquarters of the Royal Marine Commandos. Portsmouth is also a busy ferry port for both passenger and freight traffic. Portsmouth's main road links are the M275, the A3, and A2030. The M275 connects to the M27. Portsmouth has four main rail stations. These provide services to London Waterloo, London Victoria, Brighton, Southampton, and other destinations. The nearest airport is Southampton Airport. London Gatwick and London Heathrow are however less than 2 hours drive away. If you answered yes to any of these questions, then this Greater Than a Tourist book is for you. Greater Than a Tourist- Portsmouth, Hampshire, England, by Helena Cochran offers the inside scoop on Portsmouth, England. Most travel books tell you how to travel like a tourist. Although there is nothing wrong with that, as part of the Greater Than a Tourist series, this book will give you travel tips from someone who has lived at your next travel destination. This unique cruising guide features aerial photos matched with chart segments to guide you through channels and harbor approaches. Prepared with input from local experts up and down the coast, hazards, safe channels, and key navigation aids are clearly labeled on photos and charts. As you walk past ancient seaport burial grounds, slanted mossy headstones, and centuries-old neighborhoods, it doesn't take much imagination to be transported back in time. Let Portsmouth Through Time take you on a journey through this old New England seaport city. Explore several surrounding communities and learn their roles in making seacoast New Hampshire, and Maine across the harbor, the captivating region it is today. In this book, a concise, well-researched blend of history is richly illustrated with 184 images, past and present, contrasting 92 select sites from the coastal cities, towns, and villages that have evolved here. This unique universe is filled with Early and Native American cultural treasures as well as innovative lifestyle opportunities for today. Most of the lore of this land is based on fascinating historical facts. The scenery along the seacoast beaches, harbors, marshes, and islands is unmatched. Learn about grand hotels, lighthouses, an abandoned prison, and other remarkable places throughout the history-saturated seacoast. This book will challenge the reader to continue their historical journey, and travel through time to this very special place. There is no better way to see America than on foot. And there is no better way to appreciate what you are looking at than with a walking tour. Whether you are preparing for a road trip or just out to look at your own town in a new way, a downloadable walking tour is ready to explore when you are. If you Google “Portsmouth” the Virginia town at the mouth of the Elizabeth River comes up first. But while both towns were named for the port in England, the colony of the Province of New Hampshire was actually founded (although he never actually made it this far south from his landing in Newfoundland) by the captain of the English port, John Mason. In fact, Portsmouth, New Hampshire was settled (1630) and fortified more than 100 years before its Virginia counterpart. The natural harbor formed by the Piscataqua River has been compared to San Francisco for its advantages, save for a nasty current, and the early residents wasted no time in exploiting the location. Shipbuilding and trade made Portsmouth a favorite stop in Colonial times. And after America won its independence Portsmouth continued to be an important player in the young nation’s affairs. Portsmouth native John Langdon functioned as Acting President of the United States before giving the oath of office to George Washington. Portsmouth was generally considered the wealthiest city in New England and in the first census in 1790 it was the 14th most populous city in the country. Portsmouth would not drop out of the Top 20 until 1830. Fire was the enemy of these early American showplaces and Portsmouth suffered more than most. A 1781 blaze lay waste to important swaths of downtown. A Christmas night fire in 1802 completely destroyed entire blocks of Market Street and another in 1806 crippled Bow Street. Finally a conflagration in 1813 burned across 15 acres of the city and claimed nearly 300 structures. After that the New Hampshire legislature passed the Brick Act that forbade the erection of any wooden building higher than 12 feet, which displeased plenty of folks. Wood was cheaper than stone and brick and not everyone was rich. And the town was chock-full of skilled tradesmen who made their living shaping wood. This illustrated history portrays one of England’s finest cities. It provides a nostalgic look at Portsmouth’s past and highlights the special character of some of its most important historic sites. The photographs are taken from the Historic England Archive, a unique collection of over 12 million photographs, drawings, plans and documents covering England’s archaeology, architecture, social and local history. Pictures date from the earliest days of photography to the present and cover subjects from Bronze Age burials and medieval churches to cinemas and seaside resorts. Historic England: Portsmouth shows the city as it once was, from its streets and alleys to its illustrious dockyard  the oldest Royal Navy dockyard in the country, and one which boasts one of the oldest dry docks in the world. Portsmouth has been functioning in a naval capacity since 1495 and few other places have such a prominent place in Britain’s naval history. This books helps you discover this maritime city’s long and distinguished past. Portsmouth is a brilliant city! Which begs the question, why not create your own city guide and keep a travel journal to help make your time there unforgettable, fun, and organized, eh? You hold in your hands a journal and city guide re-invented for listmakers, curators, travelers, urban explorers and city locals alike! This notebook can help you keep all your important information about Portsmouth organized and ready for when you need it and where you need it. Use the pages of this notebook to document your adventures, experiences, thoughts, and memories. Have fun making lists of all the highlights and lowlights Portsmouth has to offer. This is the perfect place to journal your time with boots on the ground in Portsmouth! This is the perfect place to write down and organize everything you find fascinating about the city — which is why it's your diy city guide. Make your time in the city more fun, more organized, more productive and more creative by making Portsmouth DIY City Guide and Travel Journal: UK City Notebook for Portsmouth, England your newest and trustiest sidekick. A matchmaker contends with a troublesome couple—and a footman in danger in this novel by “a romance writer who deftly blends humor and adventure” (Booklist). Kind-hearted Miss Hannah Pym, the traveling matchmaker, is off to Portsmouth in the company of the beautiful but practical Miss Penelope Wilkins. Miss Pym quickly realizes that Penelope needs someone to enliven her sheltered life—someone, perhaps, like their handsome traveling companion, Lord Augustus Railton. Unfortunately, Penelope thinks Lord Augustus is a ne’er-do-well. Hannah may find her latest romantic arrangement a challenge—especially when their coach happens upon a footman who faces hanging for a crime he didn’t commit . . . Originally published under the name Marion Chesney, this is a delightful adventure in Regency England from the New York Times–bestselling author of the Hamish Macbeth and Agatha Raisin series.